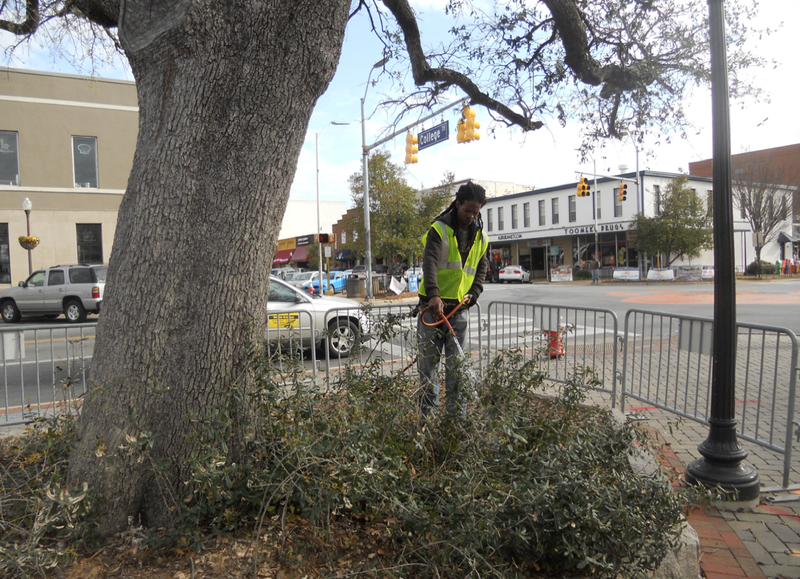 Workers with the Toomer's Task Force applied a micronutrient fertilizer to the Toomer's Oaks' root bed Thursday morning. On Wednesday, Dr. Gary Keever was asked by a reporter if signs of new growth on the Toomer’s Oaks had him cautiously optimistic about the trees’ chances for survival. The trees may not be down for the count, not yet, but that doesn’t mean they’ll win the match—even if they’re never officially declared dead. Keever, who was also an instrumental member of the Committee to Determine the Future of Rolling Toomer’s Corner, envisions a possible scenario in which the trees could stay technically alive, biologically speaking, but be “aesthetically dead.” If so, he says the oaks would likely still be replaced, a course of action approved by Auburn University president Dr. Jay Gogue in January. But in the meantime, Keever and Co. are keeping the gloves on. Thursday morning, workers with the Toomer’s Task Force applied a micronutrient fertilizer to the oaks’ root bed. And they’re currently finalizing the details of an experimental strategy to artificially feed the oaks—Spike 80 DF inhibits photosynthesis and essentially starves a tree— via what Keever says calls a sugar solution IV. The idea comes from a 2009 paper (“Carbohydrate Injections as a Potential Option to Improve Growth and Vitality of Live Oaks”—you can download it here) published by researchers at Texas A&M. If it works, it could provide the trees an energy source for even more new growth this spring. But time is of the essence. I predict ants….lots of ants. Thanks Gary for keeping us up to date on the reality of how the trees are doing. I”m thankful we have a group dedicated to trying to save the trees, but appreciate the frankness. I would love the irony of a Texas A&M study providing the solution to save our trees. A small measure of revenge against a Bear superfan/nutjob. I’m here in College Station. There is no love for Bear. He got them on probation. Bear’s apprentices, Jackie Sherrill and Gene Stallings, each got them on probation too. I repeat, no love. I couldn’t find an appropriate place to put this so I just put it HERE–> got my TWER t-shirt today and it’s AU-SOME!! Thanks TWER and Alex Miller! gbbdvm you’re welcome. Glad you like it. We will have new T-shirt designs coming out soon! If the trees do not survive, I hope the powers-that-be realize that the best replacement for the trees would be one of the baby Toomer’s oaks that the Forestry Club has been growing for years. Anything else would end one of the best and longest traditions in Auburn College history. Please, please, please eplace the trees with actual Toomer’s oak progeny!